TAP by Todd Pownell received first place for the INDESIGN Awards Gold Jewelry Category. All of the pieces are handmade by Todd, his wife and partner Debra, and a team of talented craftspeople in Cleveland, Ohio. 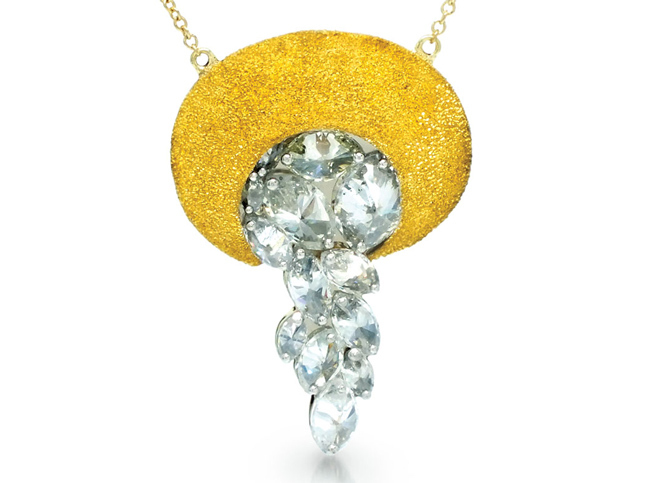 The specific piece that earned the award is an abstractions of a sunset over water, with a textured 24K gold circle with inverted diamonds set in a cascading cluster downward. These techniques are signatures of TAP pieces, which came together for a natural and magical necklace pendant. TAP was also just recently at the Couture Show at the Wynn & Encore Las Vegas. The show had over 200 luxury jewelry and timepiece designers. The owner/buyer of Santa Fe Dry Goods & Workshop, Shobhan Porter, attended the show as a buyer.